Ashanti Pyrtle preaches the importance of confidence, determination, and faith in fulfilling one's dreams. As one of just a handful of female African American oceanographers, she often called upon these qualities to realize her own life-long goal of becoming a marine scientist. She also understands that one can't do it alone. Friends, family, mentors, and colleagues encouraged her during tough times. They gave advice when she reached crossroads in both her personal and professional life. 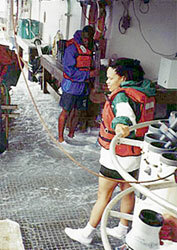 Ashanti is now a successful chemical oceanographer who studies radioactive contamination in lakes, rivers, and oceans. She has also devoted herself equally to helping other minorities fulfill their dreams of becoming successful Earth scientists. Ashanti is an expert in determining the fate of radionuclides that enter the aquatic environment. She first examined sediment cores collected from the frigid Lena River estuary in northern Siberia. Radioactive fallout from nuclear weapons tests in the 1960s and the Chernobyl accident in 1986 contaminated this once pristine Arctic environment. Every year as the ice melts, runoff from the land and flows from the river carries more contaminants into the estuary. More contaminants float out to sea on chunks of ice. 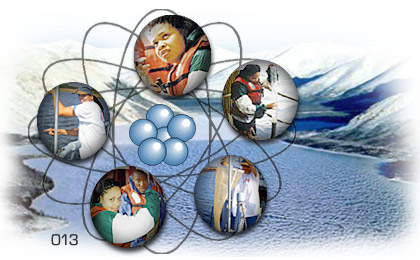 Ashanti has shown that currents carry these radionuclides towards the nearby Alaskan fisheries. High levels of many radionuclides can harm the fish and those who eat the fish. 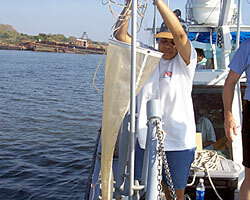 Ashanti is currently studying radionuclides in the Savannah River estuary along Georgia's coast. Some of these radionuclides likely originated upstream at the U.S. Department of Energy's Savannah River site. In the 1950s, the government built nuclear reactors that until 1988 produced material for nuclear weapons. Today they are working to clean up radioactive waste and other pollutants that seeped from these reactors into the river and marshes. Ashanti working in the Savannah River estuary. Ashanti is examining the distribution of radionuclides in the Savannah River estuary and the chemistry and composition of the sediment. One of the most common radionuclides is cesium-137, a product of nuclear fuel and weapons activities. Where the cesium ends up not only depends on currents and other physical processes, but also on the nature of the sediment. Cesium has a positive charge and binds to negatively-charged clay particles. Some clay particles bind permanently to cesium and remove it from the water column. Most clays, however, don't lock up the cesium forever. Instead the cesium competes for binding sites with other ions such as sodium, calcium, and iron. In salt water, sodium concentrations are so high that cesium doesn't stand a chance. Cesium can also lose its hold on clay particles in areas where there is a lot of biological activity. To get oxygen, microbes may break down the metal oxide coating the clay particles. With these coatings gone, the cesium must compete with other ions to hang onto the binding sites. As a result, it often reenters the water column. The information Ashanti is gathering from the Lena and Savannah Rivers and estuaries will help scientists predict how radionuclides might spread through aquatic systems if there was a nuclear accident or terrorist attack on a nuclear plant. Her knowledge of the structure of clay particles may also lead to new ways to clean up these contaminants. She is focusing on two particles that cleanup crews could apply to contaminated sites. The first, smectite, can bind to large quantities of radioactive cesium. Smectite, however, would not work well in marine environments because it also binds with sodium. The second type of clay, illite, binds with cesium, but not sodium or other cations. It could therefore be used to tie up cesium in saltwater environments. Research is not Ashanti's only focus. Ashanti knew of few marine scientists who were minorities when she was growing up. As an undergraduate and graduate student, she discovered how gratifying it was to be a role model and help other minority students meet their goals. After finishing as a postdoctoral scientist, she sought out a position where she could both continue her research and help minorities navigate through graduate school and establish careers. Ashanti serves as a mentor for a Hampton University and American Society of Limnology and Oceanography (ASLO) program for minority students. The students come to the annual ASLO meeting where they attend workshops, present their own research in special symposiums, and go on field trips. Mentors help guide them through the meeting. Ashanti is also the editor of a web page profiling minority aquatic scientists on the ASLO website. Ashanti is now the director of a program called MS PHD'S (Minorities Striving and Pursuing Higher Degrees of Success in Earth System Science). Minority students in this yearlong program attend scientific conferences and work with mentors. Through a series of discussions and workshops, the students learn about opportunities in Earth science, how to establish career goals, how to choose graduate schools, apply for fellowships and grants, refine presentations, and other practical advise. The students become members of a community of other minority students and scientists. The program encourages the students to seek out these other members of this community during their year in the program and beyond for advice and support. They will not have to struggle through the difficult process of becoming a scientist alone. Read an interview with Ashanti. Get more info on Ashanti's background. See images of Ashanti at work. See Ashanti's typical work week. Other sites related to Ashanti's career.